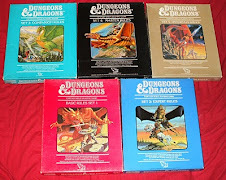 Although Gary Gygax created Mordenkainen as his first D&D character as late as 1973, I'd like to imagine that the character he played in his first RPG adventure was a sort of Proto-Mordenkainen. This first game I am referring to is of course the Blackmoor game session of the winter of 1972, when Dave Arneson and David Megarry went to Lake Geneva, which I wrote about yesterday. "After the initial Blackmoor adventure events proceeded at a furious pace. Phone calls to Dave. Letters exchanged between the two. During this time EGG noted that he had begun crafting a “dungeon” setting similar to Dave’s Blackmoor. About two weeks after this adventure, Gary handed me a slim manuscript which had been mailed to him by David. I sat down and read for the first time the rules that David had used during it." "In this expedition there was a rather indiscriminate and widespread use of lightning bolts which could be observed from a multitude of points throughout the city. The use of such pyrotechnics from a very early stage in the adventure was risky to say the least and was one of the reasons that more and more wandering monsters were encountered thereafter. As the adventurers spent more and more time within the city confines they made little or no attempt to conceal themselves or their activities and so more roving creatures were drawn to their ramblings." This lack of caution nearly cost Robilar his life. Fortunately Mordenkainen was able to save his friend and the two were among the few to have survived exploring this deadly place. Details of this adventure can be found in Oerth Journal #6. Dont'cha kinda wish we could peer back in time and watch that deal go down? I bet Dave was grinning behind his DM screen at the carnage. Oh, I would have loved to watch these game sessions unfold. I am eternally thankful to Rob Kuntz, Dave Arneson and the guys at the Oerth Journal for documenting the adventure at the City of the Gods as well as they did. If I access to a time machine (not saying if I do or do not have one, I would go back to this moment in time to watch. Interesting post but I was under the impression that EGG's character was actually Yrag the fighter. @Gray Mouser: I still have alot to read up on Gary's gaming, but for the City of the Gods adventure he did play Mordenkainen.